Xerox® Content Management Services combine document management and workflow with consultative services to automate and simplify document processes. It lets you capture, store, share and transform paper-based and electronic documents from the web, desktop applications, tablets, smartphones and multifunction printers (MFPs). Organisations of all sizes can reduce the cost and time associated with handling paper and electronic documents, enhance accuracy and repeatability of work processes, and increase compliance and security over the life of a document. 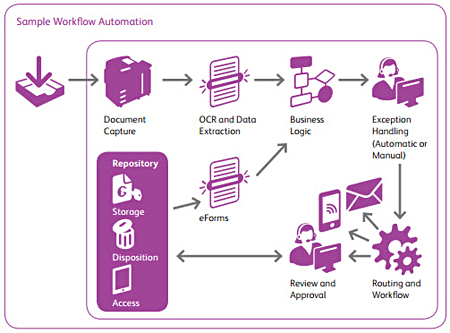 Xerox® MFPs use ConnectKey® for distributed document capture. Embedded OCR allows easier digitization. Mobile access and processing are possible from iOS and Android devices.